Read this Port Authority message above. Do one need to say more about this. A ugly and rusty port authority shed, never ever used for decades, right in the eyes of 1000's of tourist on their way to Magnetic Island, with the ferry. Here we are talking about beautification of Townsville City and this waterfront property of the Port looks like a Tropical hell. 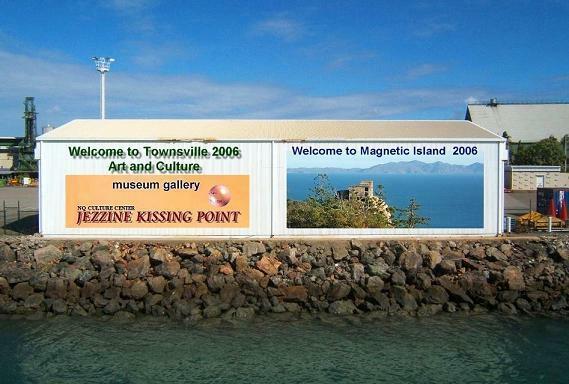 << Click on the picture and read what The Port Authority said a year ago about this.I really don't trust Townsville City Council anymore. I hope they don't use my idea for their own project now. It would not surprise me. Next time they may steal this design and IDEA. Few things are more frustrating than dealing with those who either won't discuss problems or. worse, pretend there's nothing wrong. The reason they're behaving this way is they're frightened, primarily because they don't know what to do. Talk things over in reverse order therefore, starting with solutions and working backwards until you're actually discussing those problems openly. "CASHED UP ... Cr Jack Wilson is calling for more mural walls. Councillor Jack Wilson made the call this week saying the city needed brightening up with some commercial murals. He has the money and he is not afraid to spend it."